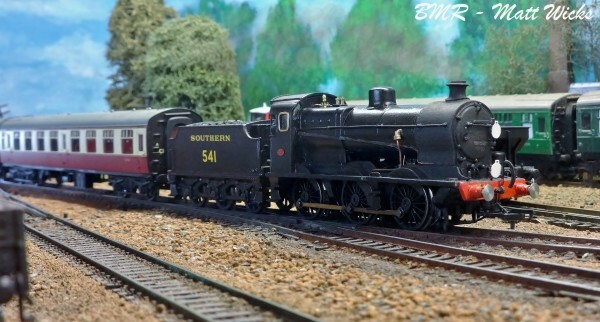 A model railway, based on Horsted Keynes on the Bluebell in OO scale. The track diagram has been adjusted from the real Horsted keynes to get everything to fit in a very tight space. I had to take out a few sidings which link up to the Ardingly branch which spurs off to the top of the diagram, and also some sidings from where the carriage and wagon workshop would be. The original idea was to try and re create as close as possible whilst on a tight budget to the original station. This meant taking a few shortcuts, buy building things on my own and also modifying stock items. Track from the project was brought in July time in 2007 from Hattons. All track is Peco including the points which are the express type. Most expensive part of the track was the bulk of streamlined flexi track and the 3 way point located at the end of the layout towards the North. In total this cost around £200 in total. The base board is 12 mm thick ply, supported by a pine frame, which is screwed in to the wall (Should be fun if we ever move!). The basic line and layout was planned at the end of July, and started laying track. I made quite a few mistakes in the build of this line, one major one was assuming that soldering the track together would work. Well it don't folks so don't try it, I had to rip up all my track and relay it with fish plates, so don't cut corners when it comes to this! Progress in th last few years has been steady generally updating old track buildings updating the layout in general. 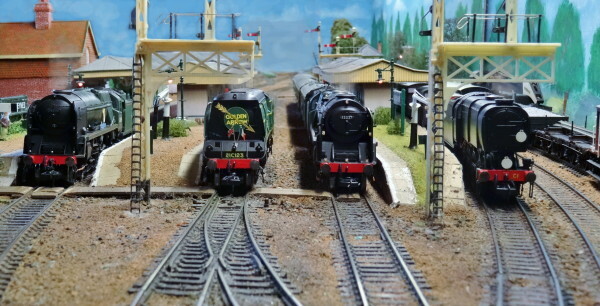 The layout moved to the shed in mid 2009 allowing more space for expansion and more updates. The updates since moving included new track work, leveling of track, fixing of ballast, and back scenes. In early 2009 an extension was built based loosely on East Grinstead and the extension the Bluebell line were working on. This was completed in June, and linked up with Horsted Keynes with an outside section at both ends. Work again has progressed steadily and problems overcome. During the winter 2009 (present) work will be continuing on the layout even if running has been stopped due to the weather. The next update will be quite big. The side of the layout will be extended making room for 2 new sidings where the C&W are and also this will extend the platform back making room for a station building and another Canopy. Having moved away from home in 2015, I am looking in the future at rebuilding the layout fully, it is now 12 years old, been in a few magazines, but now having more expierence than I did when I built It I am sure I can make it better than it is. The layout is deteriating due to it being in a shed exposed to the cold, and damp, and it certainly is starting to damage motors, connections, nd track work. I hope to improve many areas of the layout when it's rebuilt, making it possibly a bit bigger, extending the platforms to take 5, instead 4 coaches, getting the details more correct, enabling the signals to work, adding more lighting to the layout, making the layout work better, and also it will be kept as DC. With all the locos collected and rolling stock growing It does need updating with models getting more fine, and run to very fine tolerances especially some not liking bumps and dips in the track.